Chuck Brookley was the owner of Thermogage, Inc. for nearly 30 years until his death in 1999. He was an innovator, clever designer, expert on high temperature graphite properties, chemist, businessman, fly fisherman, photographer and environmentalist. He and some friends started Thermogage while working on high temperature materials testing at the US Navy's Allegany Ballistics Laboratory in Cumberland, MD. He had come there from a tour of duty in The US Air Force where he had been involved in explosive ordinance disposal after earning a Chemistry degree at the University of Maryland. At the Laboratory, he spent years characterizing materials properties and rockets to help improve nozzle designs. Often they had to make their own devices for work to 3300°C . Themogage began to commercialize a Gardon (R. Gardon, Rev. Sci. Instr., 24, No. 5 ), high flux-high temperature heat flux sensor they built. A high flux radiant source was needed to calibrate them. Thus the graphite flat plate heater was developed from the high temperature Blackbody they had built. Chuck bought sole control of Thermogage in 1971 and produced gauges and furnaces until his death. The gauges are now produced by a separate organization. Thermo Gauge Instruments was formed to support the furnace market and present customers. One of Chuck's papers, "Determination of Blackbody Radiance at Temperatures above 2300 °C" (coauthor W. E. Llewellyn) was presented at the International Temperature Symposium in Toronto 1992 and is published in its proceedings, "Temperature, Its Measurement and Control in Science and Industry, Vol.7". A Thermo Gauge Precision Blackbody can also be used to calibrate high flux gauges with the flat plate adapter. 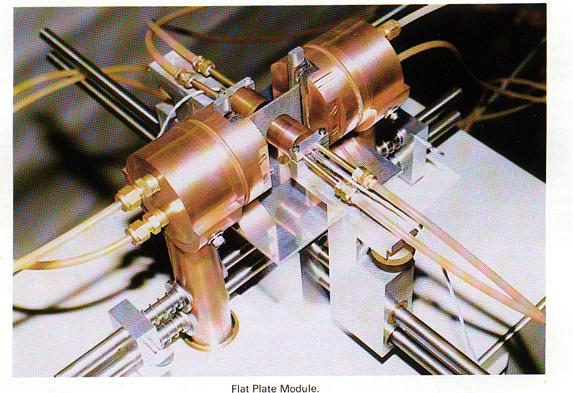 In Blackbody operation the flat plate shown above is replaced by the dual cavity assembly and components shown elsewhere on this website. The heat flux gauges were the original products of Thermogage, Inc.